Message to white America: Ask reparations offenders Kyser Miree or Jennifer Ross if you are responsible for your kind’s refusal to make restitution for its generational race crimes. 7The entire “Western world” profited and still reaps benefits from both that slave trade and the concept of white supremacy and the institution of the Trans Atlantic Slave Trade. Therefore, the entire white world owes. Contemporary whites’ position that they don’t owe for slavery is in the same vain of their morally degenerate forefathers who set forth barriers to make the climate to seek reparations impossible after their so-called abolishment of slavery was set fourth. From the 15th Century through the 19th Century, it is estimated that 15 millions Africans were enslaved. The Nations involved the the African Slave Trade – Portugal, Spain, England, Holland, France, the Arabs, and theier Africans collaborators, were responsible for the Enslavement of these Africans. The New World (North and South America) and these Nations Used the Enslavedafricans Labor to Developed their Countries. White 1st Amendment Racial Terrorist "Anonymous" Says: "Report this website. This website violates of Google’s TOS. Please report this abuse to Google @. Support.Google.Com. Here is a 2nd address Wwww.StopRacism.ca. Thanks in advance for helping shut down racist propa-ganda." … The NBFSN neither supports violence or hate against the racially terrorist regime of white America. The NBFSN supports justice & condemns white America’s historic & on-going Holocaust denial. Is it the fault of this community that "white" and "injustice emerged as synonyms; or, is it the fault of your own kind’s reprobate and racially terroristic behavior? Anonymous: Your subjective opinion of this website as a violation of Google’s terms of service is based on your inability to recognize that you are a reparations offender and racial terrorist who our citizens live in fear of. While Trayvon Martin is just the latest example of it, the history of the United States of (White) America is plagued with the white racial terrorism our people have faced, face and live in fear of at your people’s hands. That fear that history teaches us we must fear for our lives before your so called police officers and even citizens with guns makes you racial terrorists. We have the right to protect and defend ourselves from white racial terror. The NBFSN neither supports violence or hate. The NBFSN supports justice. Rhetorical: is it the fault of this community that “white” and “injustice emerged as synonyms; or, is it the fault of your own kind’s reprobate, racially egotistic and morally degenerate a behavior? Don’t confuse George Zimmerman’s Hispanic ethnicity with his racially terroristic white mindset. For we know that in this world is not blacks against whites. It’s the family of the people of color against those who lack it. That George Zimmerman had been and is brainwashed into your kind’s racially psychotic way of thinking is no surprise. There are also blacks who are still victims of this racist psychological poisoning. As stated: we are not your enemies. We are your victims. You set yourself against us to be our (the family of the people of color’s) enemies. And this is the continued struggle for justice against the infamous white regime of racial terrorists – of which you are one. The “racist propaganda” is the continued denial of restitution for your kind’s crimes. The racist propaganda is your kind’s racist characterization of “reparations protests” as “robberies, carjackings and home invasions. The racist propaganda is the characterization of your kind, who studies show are one hundred percent responsible for turning these peaceful protests violent, as “victims” instead of “generational race criminals in support of your forefather’s racial terrorist Holocaust denial. If, by chance, you are able to persuade someone at Blogger that you are not the racist propagandist that you accuse the NBFSN of being, we’re not going anywhere. All content is archived and auxiliary publishing plans are in place. Your: “http://www.stopracism.ca/content/report-hate-social-networking-sites should be: http://Www.StopHolocaustDenialof Whites. FTFY! Much more, Anonymous: these blogs voice minority opinions and interviews. The NBFSN does not hate white people. But, rather, the NBFSN hates injustice. Rhetorical: is it the fault of this community that “white” and “injustice emerged as synonyms; or, is it the fault of your own kind’s reprobate and racially egotistic behavior. Your attempt to characterize the NBFSN as being in “violation of Google’s terms of service” is intentionally misleading. Your racism is showing from behind your pretencious mask of objectivity. In fact, your hope is that Blogspot editors won’t be able to tell the difference. This makes your attempt the very racism you accuse. The root of your complaint demonstrates that you are a typical white 1st Amendment racial terrorist. 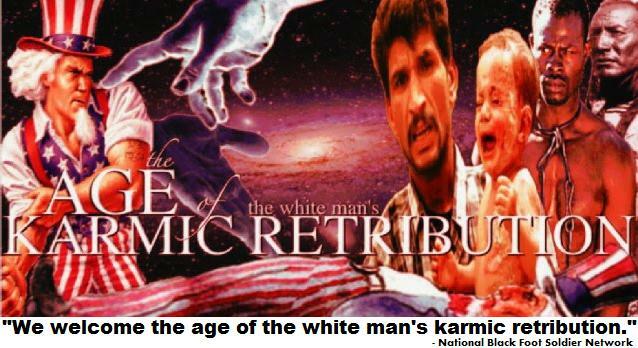 Leaders and members across the National Black Foot Soldier Network have launched a nationwide discussion on the racial karmic retribution the white man has opened himself up to because of his kind’s unrestituted for atrocities against the world’s people of color. Should South African Uhuru Cultural Club Leader Faraday Nkoane "it is righteous to steal from & slay whites" Edict Be Embraced By All People of Color & Whites Desirous of Righteousness Worldwide? Johannesburg – The leader of a Pretoria-based youth organisation has issued a controversial statement by telling youth to go and steal from white people in the suburbs.Faraday Nkoane, the leader of Uhuru cultural club, told 100 youngsters who attended the Human Rights Day celebration at Lebanon township park to go and steal from the whites because “it is the right thing to do. “Stop stealing from black people because they will deal with you in an African way. They will bewitch you and you will go crazy. The whites have stolen from us since April 6, 1652. Our ancestors’ cattle, goats, sheep, chickens and others are in the hands of the whites, while we are left with nothing. Go and steal from them because it is right. See: The Eve Carson Reparations Protest! “Taking from whites is not a crime because you repossess what belongs to you. But make sure you are not caught,” said Nkoane, addressing the youth, most of whom were in Rastafarian colours. When the Daily Sun approached him about his controversial statement that would cause hatred between South Africans, Nkoane said he stood by his statement because “nothing is wrong with it. “Yes, nothing is wrong with my statement because the whites have stolen from the blacks. “My statement doesn’t promote any hatred because I did not call for violence against the whites. I only told the youth to go and repossess from them. If youth steal in the township it is crime, but if they steal from whites in the suburbs, it is not a crime because they are merely repossessing,” said Nkoane. While we can never support, glorify or encourage violence against whites – even though, because of their failure to make restitution for their generational race crimes, it is the order of Divine Racial Karma, “Until reparations has been paid, there’s no such thing as black on white (BOW) crime,” says National Black Foot Soldier Network General Cedishon Angelou. "Get over it!" .. "You were NEVER a slave!" .. "But only 26% of whites owned slaved." .. "Nobody owes you ANYTHING!" "We didn’t own slaves." .. "Your own kind sold you into slavery!" "Blacks weren’t the only slaves." .. "The Irish were slaves too!" .. "You never picked ANY cotton!" … Denying reparations are owed for the Trans Atlantic slave trade is racist. Modern definition: bq. rac·ism /ˈreɪsɪzəm/–noun 1. a belief or doctrine that inherent differences among the various human races determine cultural or individual achievement, usually involving the idea that one’s own race is superior and has the right to rule others. 2. a policy, system of government, etc., based upon or fostering such a doctrine; discrimination. 3. hatred or intolerance of another race or other races. Is it surprising that contemporary Western definitions of racism (defined by non other than the heirs of the legacy themselves) modified it to suit their needs. Things whitey don’t want you to know: Pineal + Eumelanin + Focused Vision = the ability to reproject the UV sunlight your skin absorbs.